Over the weekend I went on my first self-planned trip! I wanted to go somewhere in Italy for my first trip so Venice seemed like the perfect place. On Thursday night we took a 9:30 pm train that arrived in Venice around five in the morning. It was definitely a new experience to take a night train in a country where I don’t speak the language very well. Not everyone is assigned seats on the train so there were people standing in the aisles. Since a lot of people are sleeping, so they don’t announce the names of the stops, which made it difficult to determine when our stop was coming up. The train ride became even more stressful when we realized that we accidently bought tickets for the wrong day! Luckily, the train conductors didn’t make us buy new tickets, but that also meant that we didn’t have assigned seats anymore. After walking around for a little while, we did find some empty seats to use for the remainder of the train ride. Once we got to Venice we went to the ticket desk and switched our returning tickets to the correct date so we wouldn’t have any more problems on the way back. Then, we took the waterbus to our hostel. I thought it was pretty cool that there were boats for public transportation! When we got to our hostel we wanted to take a quick nap before exploring the city, but there were people sleeping in our beds still so we just dropped our backpacks off in lockers and were on our way to see the city. We spent the whole rest of the day walking around and seeing all of the sights. We saw the Basilica di San Marco, Campanile Tower, Rialto Bridge, Jewish Ghetto, Frari Church, and Palazzo Ducale. There are shops all around the city with souvenirs: Venetian glass, scarves, and lace are common items. The canals that run throughout the city are really beautiful too. We walked around literally all day until around seven when we returned to our hostel for a nap before going to dinner. We had dinner along the canal near Piazza San Marco. Venice is a really great place to just sit outside and enjoy the views! After dinner we went back to our hostel again and I fell asleep right away after such a busy day. 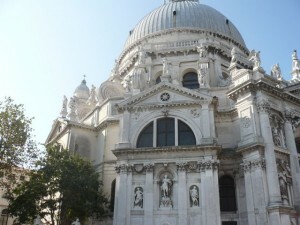 The next morning we checked out of the hostel and went to see the Santa Maria della Salute Church before heading to the train station. It was really beautiful, especially from the outside, and I liked that it was in a less crowded part of the city. I really liked seeing Venice, but there were a lot more tourists and crowds than I expected. I read in the travel book that the majority of people in the city each day are tourists, not actual residents. We grabbed some pizza for lunch and I got a pastry to eat as a snack on the train. The train ride was a lot more relaxing on the way back. We stopped at Burger King for dinner when we got off the train. That was a needed change from all the pizza and pasta I’ve been eating lately! Finally, we arrived back at the JFRC around 9:30 pm Saturday night. It still amazes me that we saw so many things in the 48 hours that we went to Venice. I feel like we were in Venice for a pretty good amount of time to see all of the major sights and I’m happy to say I had a great first trip! Staying in Rome this weekend turned out to be an awesome decision. Vogue’s Fashion Night Out was on Thursday and it was so much fun! I heard about it from some people in one of my classes and we decided to check it out. 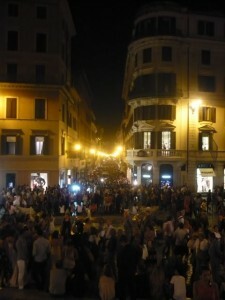 We went to the area around the Spanish Steps where there are a ton of high-end stores. There were so many people in the streets! Many of the stores had DJs or bands playing. It was also really exciting to get to look around in some of the designer stores, like Gucci. Usually stores like that seem really exclusive but there were so many people around that we could go in any store we wanted. It was cool to see the inspiration for the clothes I buy at “fast fashion” stores like forever-21. Forget about the clothes, even the stores themselves were really beautiful. Gucci had rich wood paneling on the walls and golden chandeliers. Just walking around the streets was fun too. Everyone seemed excited to be there and there were models that went into the crowd to show off their designer’s clothes. All in all it was an great night and I definitely want to check out Vogue’sFashion Night Out in Chicago when I’m back at Loyola next year! This past weekend, my host family took me to their vacation house in Tequisiapan in Queretaro. It was marvelous. We left Thursday morning, since it was Independence Day, and got back today (Sunday). It was essentially 4 days of eating, drinking, partying, tanning, shopping, and more drinking and eating. Thursday night, we went to the center of Tequis to hear “El Grito” which is where the mayor comes out and says rings the bell and everyone shouts “Viva Mexico!” like 30 times to mark when Miguel Hidalgo rang the bell to mark the start of the Independence against the Spanish. Fireworks, music, all that. After that we were out partying til the wee hours of the morning, Mexican style–eating, drinking, dancing, singing at a friend’s house. Friday we layed low until later, where we went to another party…Saturday we got up and went to another town, Bernal, which is another “Pueblo Magico” like Tequis, to eat some famous gorditos and shop. Bernal is also known for having one of the world’s 3 biggest peaks. Unfortunately, I was dumb and didn’t bring real shoes, so climbing the peak in flip flops was not going to happen. What I really enjoyed the most about this trip was meeting some great people. These friends of Lupita and Gonzalo have been friends for many years and their kids and Gon and Gina have been friends since they’ve been born. They are welcoming, fun, kind and hilarious. It was really great being able to spend my weekend with them and I’m so blessed I was able to take this trip. It was a relaxing and enjoyable weekend overall. These past weeks have been tough. Over the summer I did very little – I led a very sedentary lifestyle. Over the summer I would sleep in for hours and not even care. I would cook food slowly, taking long breaks throughout. Time had no value because time had no limit. If I spent too long at my computer and because of it didn’t go to the store, it was no problem – there was plenty of time left. Now time is a precious commodity. Studying Chinese has taken most of my free time and turned it into study time. It’s been difficult finding time to update this thing. Pronunciation: Tricky but manageable. What’s difficult is making the delivery sound natural and not ridiculous. Chinese is a tonal language, meaning the words change based on the tone at which they are spoken. There are four tones, and each is represented by a line above the vowel which represents how the tone of your voice should be. So if you want to introduce your mom you would say 这是我的吗，zhè shì wǒ mā, this is my mom . But watch out, because if instead of mā you say mǎ, you just said ‘this is my horse’ – that’s embarrassing. What gets hard is when you know it’s mā, but you want to say it without it sounding like ‘this!-IS-myyyyy-MOM?’. Grammar: Honestly the basic grammar is very easy. No masculine/feminine, no verb conjugation, no plural – pretty basic. But check it out – you know how in English we don’t use tones per se, but a lot is conveyed by putting emphasis on certain words (this IS my mom, this is MY mom, THIS is my mom?! ), well you can’t do that in Chinese without messing up the tones. So that means the structure of your sentence will change wildly depending on what is being emphasized. ‘where is the restaurant we ate at last night?’ can become ‘last night we ate’s the restaurant where?’, or ‘the restaurant we last night ate’s where?’ or a few others depending on which part of the sentence is the most important. Try thinking that over when you’re trying to talk to a taxi driver who’s holding up an entire lane of traffic to pick you up. Writing: Yeah – the issues raised above are nothing compared to this. Above you saw the writing with the little squiggles above the vowels, that’s pinyin. That’s the alphabet you have to learn just so you can start learning characters. I always looked at Chinese characters with such intrigue, wondering what their secrets were. Well here it is: rote memorization. It’s like learning a new alphabet every day. Of course some people will say, ‘Sounds like SOMEONE’s never heard of radicals’ – as if they were panacea. Radicals help only slightly. Radicals are the most basic parts of characters, and are also characters themselves. So one radical is 人, which means man, and when it appears in a character it looks like this 你, the little slanted T on the left. So like forest is 林， with 木 meaning wood (Get it? It looks like a tree!). But it doesn’t always work that easily. Let’s say you see this word 飞机, here are some hints – the first character means fly, and the second radical in the second character means several. So you got ‘flying severaltrees’. What the hell is that? ‘severaltrees’ can’t mean forest ’cause you already know the character for that. Hmmm. Here’s the last clue: 木 and 几 together mean ‘machine’. Flying machine, pretty obvious: it’s an airplane. But it isn’t always that easy. Let’s say you know the characters for this word: 电脑. ‘Electricbrain’, but what does it mean if they’re together? Are there robots in China? Some of you might’ve gotten it, it means ‘computer’. Here’s another one: 红绿灯， ‘redroadlight’. It’s pretty straightforward, right? Easy – ‘traffic light’. Last one, this one’s tricky, but I think it’s more indicative of how these actually are: 东西, ‘Eastwest’ . Hmmm, ‘eastwest’ maybe it means longitude? Nope, it means ‘things’, or ‘stuff’. Did I say that was tricky? I meant impossible. But let’s say you happen to just know, because you memorized it. You know the word! Now say it to someone……..that’s the next problem. The pronunciation of 东西 is Dōngxi. You must also memorize that. Ultimately, the ‘tools’ used to help learn Chinese do little to hide that fact that the most important thing is your ability to memorize symbols that have very little to do with what they actually mean and then associate a sound with them. Chinese is tough. I have been in Prague for 3 weeks now. It is strange how time passes. In some moments, it feels like time is nonexistent and I am simply standing still in awe of the beauty that I see on a daily basis. Other times, I cannot believe how quickly the sun sets and rises each day and I want it so slow down. Perhaps, my favorite thing to do in this beautiful city is to simply meander along the cobblestone streets. Sure, I love having a plan and visiting specific places and museums; however, I feel that I have perfected the skill of aimless wanderings. Many times instead of taking the Metro back from school, I decide to take the scenic route and walk. I feel so alive walking the streets, admiring the architecture, hearing the diverse languages and truly allowing myself to be an observer. I find it fascinating to interact with all the other tourists and learn about the various cultures. Prague is truly an international city and it is a fascinating place to study and live. Prague is a very inspirational place. Surrounded by the history of some of the best writers, composers, and artists, I feel the need to be constantly discovering art. 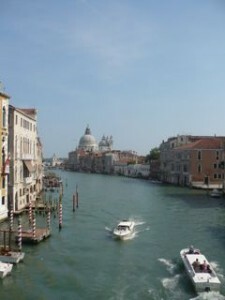 It is very easy to do so because there are exhibitions on every corner and the city is filled with statues and artwork. I feel as though I am in a constant state of discovery, open to new knowledge. Tonight, I had a perfect moment while writing my first paper for my Jewish Studies class. I heard the tinkle of piano keys so I opened my windows and listened to my neighbor across the courtyard practice. It was truly a beautiful moment and turned an ordinarily dull paper writing session into an inspiring session where words poured across the page effortlessly. As for how my classes are going, I never thought college would allow so many fieldtrips. In almost every class here, the professors plan fieldtrips. It is fantastic and allows for true hands on learning. For instance, in my Jewish Studies and Holocaust class, I went to the New Jewish Cemetery which house Franz Kafka’s burial ground. Ivy was sprawled over all the gravestones and created a very mystical and spiritual feeling. Although, I have not seen the famous Old Jewish Cemetery yet ( this is planned as a later field trip), this cemetery was one of the most beautiful shrines to man kind that I have ever seen. Tomorrow, I am going on a day trip to Kutna Hora which is a very important medieval town for the Czech Republic. During the 13th century silver was found in Kutna Hora and the supply was so massive that it suppled one third of all of Europe’s silver. The silver discovery provided great wealth to the King and made the Czech crown highly sought after by the rest of the European monarchies. Kutna Hora is also famous for the “bone church” which was created by priests. While mining for silver, a large amount of bodies were unearthed. Because the priests viewed this burial as sacred, they didn’t want the miners to simply discard the human remains. Instead, they took them and utilized them as decor for the church in what they thought was the most respectful way of honoring the dead. While there are a few other churches of this manner, in typical Czech fashion, the “bone church” is grander than the rest. I will update soon. Happy Reading! I’ve been in Italy for two weeks! I feel like I’ve done so much in the past couple weeks, but at the same time it feels like I just got here. Over the past weekend, the school planned a trip to the Italian region of Umbria. All 200 students got on buses and we traveled to five smaller towns. Even the views during the bus ride were gorgeous! There are so many more hills here than in the Midwest at home. I was also surprised to see that there were so many towns even in rural areas. After a couple hours bus ride there were still a lot of buildings and towns dotting the landscape everywhere. The first stop we made was in the town of Todi. It was on a hillside and we took a small shuttle up the side of the hill to get to the city. We went on a tour of the city and went in a church (the first of many I saw on this trip). After a short amount of free time, we were on the bus again traveling to Spoleto. This was where our hotel was located. At first our hotel seemed to be on the outskirts of a very quiet, small town; but when we walked about 20 minutes down the hill there were a lot more people and shops. I was really surprised that a short walk could reveal such different surroundings! On Saturday, we went to Gubbio during the day. As in all the towns we visited, we went on a tour of the city. The tour in Gubbio was my favorite though, because the guide spoke a lot about when the buildings were built and how to identify the different time periods. There were a lot of buildings that were built during medieval times. These dwellings were mostly small towers that were a couple stories tall. I didn’t expect multiple- level buildings to be so common. The guide also showed us a feature of these buildings called “death doors”. These doors were originally used for funerals but later became useful for security because they were located a couple feet off the ground. Because of this, people used movable staircases (basically stepladders) to enter these houses. That night, we made a quick stop in Foligno to see how olive oil is made and got back on the bus once again to go back to the hotel in Spoleto. Finally on Sunday we went to Perugia. There were a lot of cool shops and the views from the center of town were really beautiful. 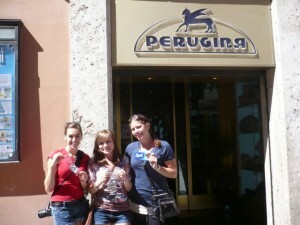 I even went to the Perugina store and got some of the famous Baci chocolates. They were pretty melted by the time we got back to Rome since we had been outside and on a warm bus all day but they were still pretty tasty. Overall the weekend was fun. There were a lot of tours and we didn’t get much free time, but it was cool to go to some small towns that I wouldn’t have to gone myself. Although its only week 2, I’m already pretty busy with school during the week. I’m excited for this weekend though; since it’s the first time I’ve had a weekend to do whatever I want in Rome! Okay, I apologize for the horribly cheesy pun that is the title of this post, but I could not resist. In all the tourist shops here, that phrase is printed on bags, t-shirts, sweatshirts and shorts. Because I will be resisting the temptation to buy a t-shirt in every color for my friends back home, I will simply document the phrase as the title of this post. Today, I took my Czech Intensive Course final. I anxiously studied the night before in hopes that through the miraculous process of osmosis I would be able to memorize the hundreds of vocab words, phrases, and conjugations that I would need to know. Much to my surprise the exam went well and I was pleased with my results. My teacher, the saint that she is, graded our exams while we watched a movie so that we could relax and not fret over our grades. My experience with the Czech class was very positive. My teacher really wanted us to do well and learn, not because it was a grade but because it would enhance our time in Prague and help us communicate with the locals. Our class appreciated her effort and patience so much that we made her a card and bought her flowers. She was overwhelmed with emotion and humbly thanked us. It was so nice to see how happy she was and I was again reminded of how nice it is to simply show individuals that you appreciate them. She also asked us if anyone would help teach her husband English. It looks like I will be helping out; I think it will be a neat experience. The past two weeks have flown by. I feel completely comfortable with the city and know my way around fairly well. I consider myself lucky because I adjust to new places very easily and adapt quite rapidly. Sometimes I even forget that I am thousands of miles away from home, but then I hear Czech and I realize that I cannot understand them and I am quickly reminded just how far away I really am. However, the anxiety of daily transactions such as talking to the cashier at the potraviny (grocery store) has dissolved. I now feel able and confident enough to talk to the locals using my basic Czech. The nuanced mystique has worn off and I feel like I am ready to explore the true Prague through the eyes of the people that call it home. A couple things that I have learned in the last 2 weeks. When you travel, learn,at least the basics of the language that you are traveling in even if it is only a few words. I have observed and experienced that when you at least attempt to use the local language rather than being made fun of, the locals appreciate you making an effort. This is very true in the Czech Republic. I had experienced a few less than friendly expressions when I only spoke in English in certain places. This is not to say that the Czech are not friendly. However, they are accustomed to tourists who come and go and do not necessarily care to delve deeper into their culture and language. The Czech are very proud people and even though English is taught in schools so that most younger people know it, the older generations speak only Czech. Because of their tumultuous history of being ruled by the Austro-Hungarian Empire, the German occupation of the former Czechoslovakia and the communist regime in the Eastern Bloc, the Czech people have had their fair share of language take-over. There have been periods where Czechs were forced to learn German or Russian. Now, the Czech people are very proud of their language and maintain it quite well despite the English language’s attempt at a global take-over. While there may be a time where I am exasperated at trying to communicate and my limited Czech is getting me nowhere, I have to be calm and patient. I try to think of it in reverse, Americans are often less than patient with foreigners who do not speak English. It is important to respect a host country’s culture and language is perhaps one of the most prominent aspect of a country’s culture. I always try to remember that I am a guest, and that if I try politely to use the words and phrases that I have learned I am showing the Czech people that I respect their hospitality. Since I have used my phrases in restaurants and stores, the people have been overly pleasant and have even taken time out of their day to help me with some more phrases. A little effort goes a long way. I have a lot in store for this weekend so I will let you know how my adventures go soon. Today was only the first day of classes but so much has happened already! Since getting off the plane last Wednesday, I feel like I have been constantly busy adapting to my new surroundings. I don’t feel like I’ve experienced complete culture shock but it will take some time to get used to the culture here. On the first night I arrived, we went on a walk around the neighborhood to check out the local sights. All the stores around campus were closed by 8 o’clock. This was strange since I’m used to the 24-hour superstores in the U.S. Over the past couple of days there have been tons of orientation activities and I’m excited to get into a regular routine where I’ll have some extra time to explore Rome and other parts of Europe. We went to the Colosseum and the Roman Forum a couple days ago. It was cool to see the buildings that I had only previously seen in pictures. I also found out that many of the structures had been excavated less than one hundred years ago. 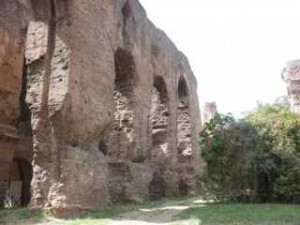 Some of the buildings at the Forum were even more dilapidated than I expected. I also wish there had been more signs about what the structures were, so I would know what I was specifically seeing. There was also a group trip to the beach yesterday. I love being outside in the sun so it was a really good relaxing day before the beginning of classes. I definitely want to scope out more beaches in the area during my time here. Finally, tonight after dinner we took a quick trip to the Trevi Fountain. It was really pretty at night and I made sure to take a lot of pictures. I also got some great Tiramisu gelato across from the fountain. I already bought some earlier today on the way home from the grocery store, but I love Tiramisu so I couldn’t resist! That’s it for today- I’ll make sure to keep updating this with details soon! I turned 20 today and I spent the day in the most beautiful city with some of the most amazing people (besides my friends and family back home of course). I will be honest I was a bit down about not being with all my friends back home for the festivities. However, I had a fabulous day. It started with my class singing happy birthday to me in Czech. It was hilarious and my teacher was adorable as she conducted the class. Apparently, the happy birthday tune is the most universal and no matter the language, it is always the same. Good to know. I was able to Skype my mom, which is always a good thing. Advice to future students abroad; Skype will be your best friend. Calling is way too expensive and you can even see the person via video. Plus, then your family and friends do not have to buy international calling cards. I loved being able to see her on my birthday! My friends and I planned a couple trips today which include: Amsterdam, Brussels, Paris and Spain. It is so exciting and a dream come true. We ended the night at a Mexican restaurant (my favorite). It was a different one than the night before, but just as tasty. We then got our groove on at a local club and made some new friends with other students from all over the world. Nutella with a candle substituted as my birthday cake and was the perfect dessert. One of the girls from South Korea bought me flowers. Even though it has been such a short amount of time, your relationships with people grow quite rapidly and I feel like I have known them for a long time. Reflecting on my day, I am so grateful for everything. Taking in the beauty with some good people is just pure jubilation. I couldn’t be more content if I tried. Meet Lupita, Gonzalo Sr., Gina and Gonzalo Jr. 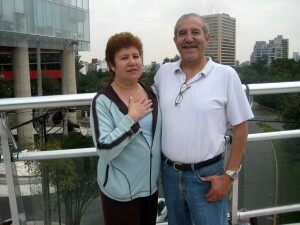 They are my host family and they’re fabulous (see attached foto of Lupita y Gonzalo). Lupita is a Mexican version of Bette Midler with her appearance and attitude, but she also feeds you and loves to dance and fight with her husband. Gonzalo is a funny old guy that loves talking…about anything, really. And making fun of his wife. Gina is funny, cool, smart and interesting. Early 30s, good job, super fun to hang out with. And has awesome, crazy travel stories. Gonzalo Jr. loves to laugh, loves going to movies, super-smart, and knows all the cool places to go. After a month of living in the Melendez house, I’m starting to feel like part of the family. Since the Melendezes have hosted 34 (yes, 34) exchange students in the past 9 years, they are pretty much pro’s; both kids went to La Ibero so they are very familiar with the school.They have lived in the Chapultepec area for quite some time, so they know the ins and outs of the city and how to get around, places to avoid at night, the usual. 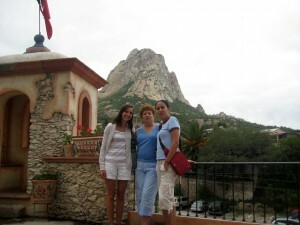 For me, living with a host family really helps me adjust to living in Mexico. But, I know people that prefer to do the apartment thing since they are used to being a little more independent, which I can see. Personally, it makes me more comfortable having a family around since I’m very used to being near my family. I guess it depends on what you are used to, but I would suggest to any prospective student to try the host family situation since it gives you that support system which is necessary when you are abroad in a foreign country, and it seriously helps your Spanish. It’s nice to come home after a long day of school and commuting to a delicious dinner and have a family ask about your day and your classes and know that they are here to help.